Maccaferri’s MacDrain W106M provided the ideal solution for a tunnel draining covering project on the Motorway A1 of the Lugoj-Deva Sector. 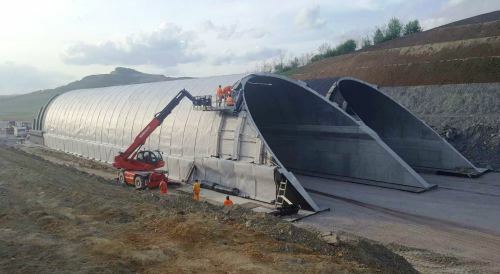 The works for ecoduct structures on the Motorway A1, sector Lugoj-Deva called for the installation of new drainage and waterproofing layers designed to protect and extend the design life of the tunnel. Additionally, the pre-existing solution generated problems as the aggregates had been installed onto the curved surface of the ecoduct. In light of these problems, Maccaferri provided its MacDrain W106M to build the new drainage system suitable for the project. MacDrain W is a drainage geocomposite for planar drainage. It is made by thermobonding three-dimensional drainage core of extruded monofilaments between two filtering non-woven geotextiles that may also be working as separation or protecting layers. The three-dimensional drainage core of the mat has a “W” configuration of longitudinal parallel channels. For this project Maccaferri proposed MacDrain W106M. In order to assure the continuity of the waterproofing and drainage the rolls were delivered at the project site with excess material on one side and special self-adhesive tape that was stuck onto the overlapping area. The material was delivered and installed in a few days time. No specialized manpower or expensive and heavy machinery were required for the project. Because of its flexibility MacDrain W106M was easy installed onto a curved shape with different gradients – vertical on the basis and horizontal in the upper cap. The designer used a technical report generated by our MacFlow software in order to ensure the longevity of the solution. MacDrain provided the equivalent performance of an aggregate layer with thickness min 0,5 m due to its inner characteristics. The special geomembrane attached on one side assures waterproofing protection of the concrete structure and the self-adhesive tape guarantees sealing in areas of overlap. The solution fulfilled all technical requirements. It allowed for cost optimization and was accepted by the client and the authorities.